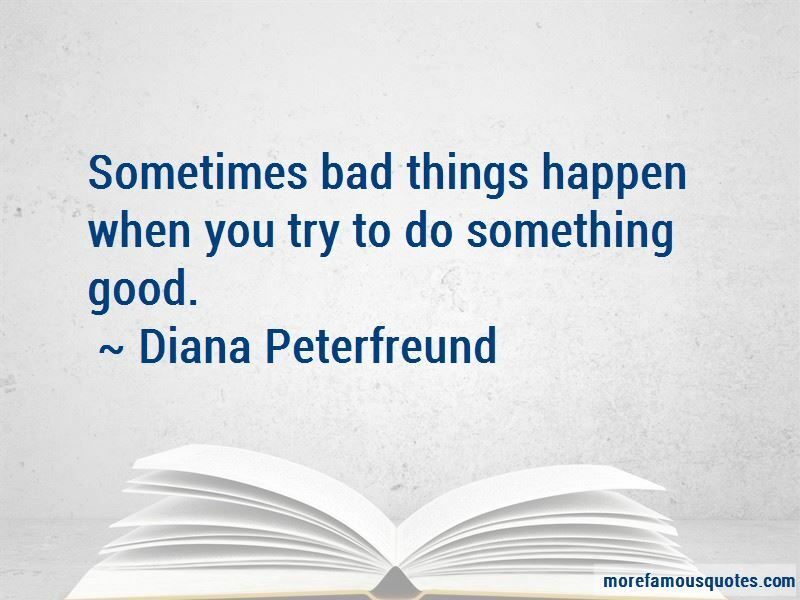 Enjoy the top 108 famous quotes, sayings and quotations by Diana Peterfreund. Sometimes it's only the young ones who are crazy enough to change the world. "No, you said 'get out'. I'm out." “Does P-Jamie ... like me?" Malcolm blinked. This was clearly not the kind of dirt he'd been expecting. "I mean,like me, like me." I clarified quickly. "What are you? Twelve?" he asked, incredulous. "You aren't supposed to make fun of me!" I scolded. "You never said you were going to act like a teenybopper. That's a special circumstance. Any judge would agree." "Fine." I started to rise. "Like I said, forget I asked." "Wait, Amy. Sit down," he said with a sigh. Malcolm was leaning his fits against the wood, staring down at his knuckles. He didn't look up. "This is all just between us, right?" "I wouldn't say he likes you." “I can't pretend this isn't important. I can't act like it doesn't exist. It's ironic, but true. There are a lot of things I'm really good at keeping secret. But I've learned I'm not too good at that with you. I can't pull it off. I don't want to just hook up. I don't want a secret relationship." "Well, that's a relief," I said, grabbing for both of his hands and holding on for dear life. Doubt started giving way to recognition, but he needed to hear it. "Why's that?" How do you know you're in love?" I asked her. "Because if it's determined by how willing you are to give up everything for the other person, I think it's a flawed system. This whole time, I wasn't waiting for something in particular. Just someone who wanted me. “And put myself in the hands of total strangers?" She snapped the lid shut, "What do you take me for? Of course I checked out their stories. I am a researcher, you know. They are who they say they are, and their stories are verifiable. You have nothing to fear. I wouldn't put my daughter in any danger." "Any danger!" I cried. "what do you call hunting unicorns? Big, sharp horns; fangs ... " And those were just the goat-sized ones. "I call it your birthright." Lilith stood tall. "Honey, I know you've been down ever since that stupid boy broke up with you but this is about more than a prom date. Don't you realize that? You have a destiny. Most people would kill for something like that." If you can stand on your own, it's better that you walk back rather than making someone from the fleet take you." Elliot rose, then swallowed the bile she tasted in her throat. "I have stood on my own for many years." He didn't look away this time, and his eyes were like a stranger's. "You're not the only one. That wonderful, terrible night when her mother died and her whole world had been destroyed, when she realized she loved Kai and her whole world had been created anew. “Hey," he pulled away and put his hand on my face. "What are you thinking about?" Ancestors who had held themselves higher than God, and had been brought lower than man. She knows your mother isn't here to protect you any more. But you know what the solution is: stay out of her way. Stay here. Stay with me. “You should know that you're exactly the person you think you are. She still loved the man who called himself Malakai Wentforth. She knew that. But that didn't matter, just as it hadn't mattered four years ago. Then, she'd chosen to stay behind. But it didn't mean she wasn't curious. It didn't mean she didn't want to stand at the edge of the cliffs and stretch her face out toward the sea, toward a world she'd never be allowed to know. There's nothing wrong with Plan B.Play it right, and no one will even know it wasn't your first choice. I have only this cave to call my own. You want to know what's even more troublesome?" I scooted up. "Our real names rhyme." He chuckled. "Yeah, they do. I never thought of that. “We've known each other for a while," I said. "And our feelings just ... blossomed." “Pleasanter surprise," he managed, backing us away from the threshold. There's the idea. I pushed him gently against the wall and started tugging on his shirt. “Beer is fine," I said. "For now." Adam waited as I put in my order. "You'll need something stiffer after Mike really starts getting to you." The key to a frittata," Mike told the camera, "is to use a really hot pan. Because that, my friends, is what makes it"- he paused dramatically -"fluffy. He hesitated. "Nothing, man. What are you doing right now?" I looked down. "Petting my snake." Malcolm laughed. "With anyone else, that would be a metaphor. Good thing I can always count on you. “Around this time, I decided to go back to the bathroom and, oh, I don't know, wash my hands, brush my hair, maybe pluck my eyebrows. “Maybe she's helping him because his hands are full," Lydia suggested. The girl kissed a trace of chocolate from the corner of his mouth. I really wish your boyfriend would stay out of my love life." "Funny. I bet Felicity wishes her boyfriend would stay out of it, too. We all deserve to live in a world where our rights aren't violated at the whim of our leaders. It doesn't matter if our leaders are kings and queens, or the people who claim to save us from them. 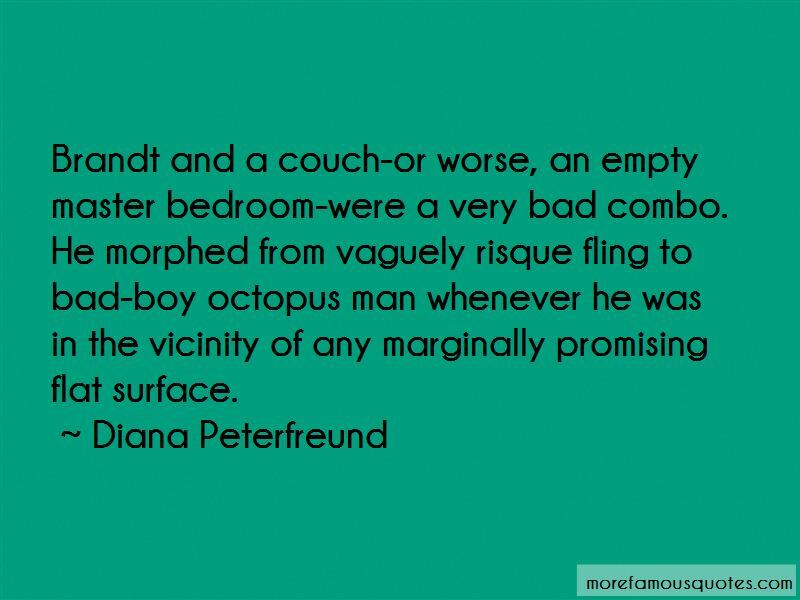 Want to see more pictures of Diana Peterfreund quotes? Click on image of Diana Peterfreund quotes to view full size.